NWA Democrat-Gazette/CHARLIE KAIJO Lincoln Jr. High School special education teachers David Bradley and Denise Fedon (from left) laugh, Sunday, August 5, 2018 at the parking lot of Sport Clips in Bentonville. 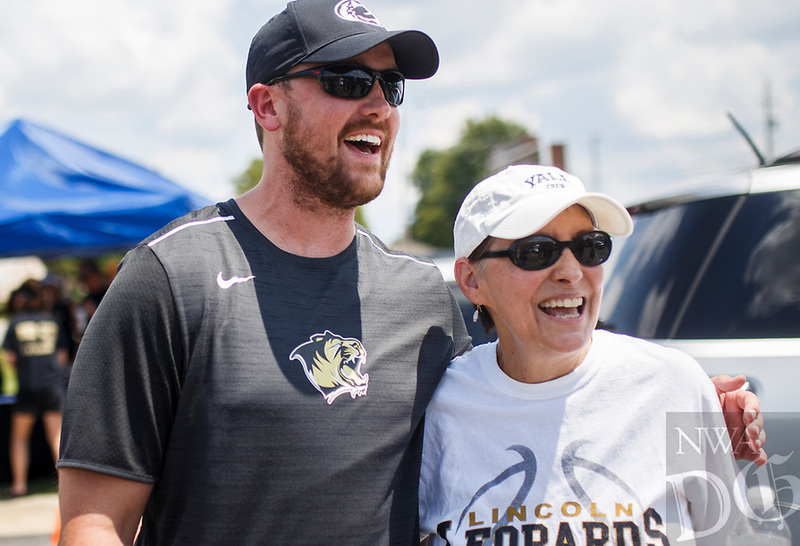 David Bradley, a special education teacher at Lincoln Jr. High and volunteer football coach at Bentonville High School, was recently diagnosed with an aggressive brain cancer. This is a fundraiser for him and includes Lincoln Jr. High and BHS football, baseball and basketball players and cheerleaders washing cars, RonÕs Burgers selling food, Kona Ice selling snow cones and Sport Clips donating $10 for every MVP haircut. The car wash was only through Sunday, but Sports Clips hopes to raise $10,000 by August 11 through the donations.